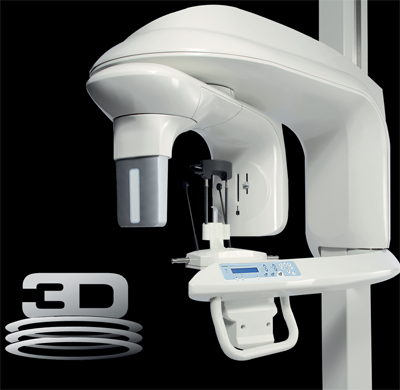 This state-of-the-art machine is not only used to take images of the entire mouth, but is designed to take highly diagnostic 3D images as well. These images are used to diagnose unseen conditions that a typical two-dimensional x-ray does not show. These conditions include, but not limited to, below-bone fractures, bone defects, and allows us to measure widths and depths of bone, abscesses, cysts, ect. The CS 9000 3D is used most often in our office for implant preparation. This enables us to accurately locate the nerve and measure all aspects of the bone in order for Dr. Kirkwood to place the best fitting implant for your mouth. Please call our office to discuss making an appointment.